It’s easy to take for granted a film’s location. Some settings, of course, are mandatory to support the historical accuracy of a film; consider the importance of location in a war picture or biopic. Other settings might not be important for historical accuracy per se, but are critical to the believability of a film. For example, Oliver Stone’s Wall Street (1987), title aside, never would have worked anywhere else but in New York City, given the high-finance, decade-of-decadence aspects of the story. Beyond instances like these, though, it’s easy for filmmakers to pigeonhole movie locations into high-level descriptions like big city, sprawling country, hot resort, or cozy hamlet. But where do you set your film when you need more than geography? Where do you set your film when the location is less about sense of place and more about state of mind? If the film is Vertigo, Alfred Hitchcock’s 1958 masterpiece about a man who might be crazy and a woman who might be possessed, then the setting can only be San Francisco. Early in the film, the fact that the setting is San Francisco is of little, if any, consequence. The story opens with John “Scottie” Ferguson (James Stewart), a San Francisco police detective, chasing a criminal on foot across the rooftops of the city; a uniformed officer assists him in the chase. Rooftop foot chases are nothing new in movies, so this action could have occurred in any major city. 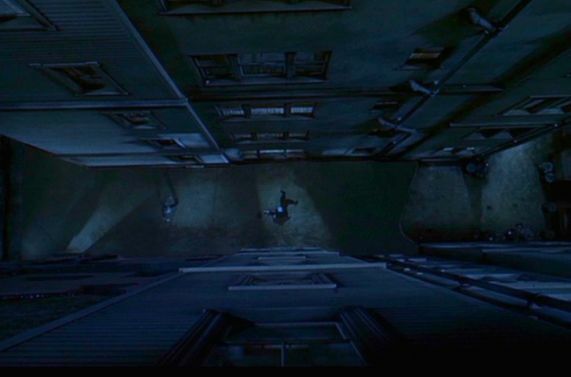 The scene ends after Scottie slips on a slanted roof and finds himself dangling from a gutter. The uniformed officer ends his pursuit of the criminal to help Scottie, but slips on the roof tiles and plummets past Scottie to his death. The ordeal triggers within Scottie a case of acrophobia – the fear of heights – and he is forced into early retirement. Maybe, but that’s no more true than if he were living in New York with its towering skyscrapers, or in Denver with its mile-highness. Let me make this clear now – Scottie’s acrophobia is nothing more than a plot-point. The film is called Vertigo, not Acrophobia. Not long after the tragic event, Scottie is contacted by an old college friend, Gavin Elster (Tom Helmore). Gavin hires Scottie to follow his wife, Madeleine Elster (Kim Novak), spinning a tale of a woman whose recent behavior has been peculiar to the point that Gavin thinks his wife might be possessed by a ghost. Gavin wants Scottie to get to the bottom of what his wife does with her days – things that conflict with what she tells him she has done and where she has gone, things that rack up too many miles on the odometer. And so it begins: not just Scottie’s pursuit of the truth, and not just his descent into madness, but the revelation of the core reason why San Francisco is vital to this film; so vital, in fact, that to have shot it anywhere else would have made it one of Hitchcock’s lesser works. The city, its places and its layout, are all physical representations of the inner-workings of Scottie’s mind. Hitchcock’s shrewdness with setting is established immediately after the rooftop chase. Scottie is in the apartment of old friend and former love Midge (Barbara Bel Geddes), who has three large windows that overlook San Francisco, and through these windows, we get a clear sense not just of how high Scottie and Midge are but, because of the city’s legendary hills, we get a sense of how far down other things are … how far down Scottie can fall. I mentioned before that this film is not called Acrophobia, it’s called Vertigo. Acrophobia is a fear of heights. Vertigo is a dizzy, confused state of mind. The difference is an important one. After meeting with Gavin, Scottie begins his surveillance of Madeleine by waiting for her to leave her apartment so he can tail her car. This is, of course, what any good detective would do, but by following her, he is, in effect, being led by her. He doesn’t know it, but as his curiosity becomes obsession, every move he makes is not proactive by him, but reactive to her. And where does she lead him on this first encounter? Down a labyrinthine path, with several turns and slow weaves through traffic, coming to a stop in an alley. Of course, streets and turns and traffic and alleys aren’t unique to San Francisco, but its hills are. San Francisco, with heights ranging from sea level to 900+ feet (that’s 90+ stories) above sea level, has a unique combination of population density and radical height differences – a combination you won’t find in another city. With that, the most important word in the description of Scottie’s first surveillance of Madeleine is “down.” Scottie’s first physical trip down the steep, hilled streets of San Francisco in pursuit of the truth about Madeleine is his first psychological step down the steep, perilous path of obsession with (and madness over) this beautiful and mysterious woman. After purchasing flowers, Madeleine continues to lead Scottie, and her next stop is the cemetery at Mission Delores. This location is critical, too. It isn’t just a cemetery, nor is it just a cemetery adjacent to a church. It’s a cemetery that requires you to navigate through a church to get to it. And the grave she visits requires a walk along a winding path through the cemetery. And all of it – the grave at the cemetery next to the church – is a downhill drive away from the flower shop. The further down the hills of San Francisco Scottie follows, the further down the path of obsession and madness Madeleine leads. And continues to lead, this time to the Palace of the Legion of Honor – the art museum where she stares at the painting of the woman we later learn is Madeleine's great grandmother. This time, the drive is relatively flat, but the walk from the car to the museum is a long one. When it comes to visiting these places, the drives and walks aren’t short and quick. They are twisting and turning and long and eventual, just as Scottie’s descent into madness isn’t a short and quick plummet; it, too, is twisting and turning and long and eventual. Whether on paths though alleys (the darker side of Scottie’s soul?) or churches (Scottie’s own shot at redemption? ), every physical step brings him closer to Madeleine – a closeness that only feeds his obsession. Madeleine’s last stop is the McKittrick Hotel. Again, the ride is flat, but something different happens. Scottie watches Madeleine enter the hotel and pass by a second-story window. 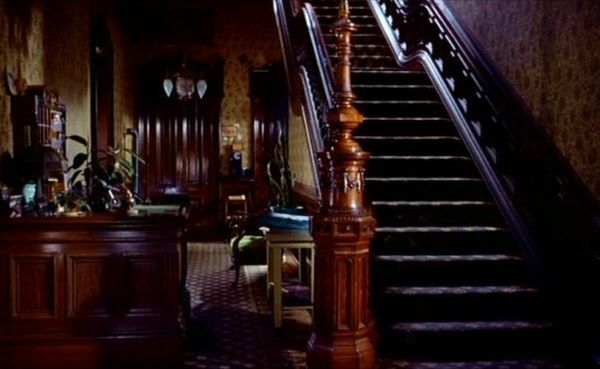 But to enter the hotel, he must climb a steep flight of stairs (which he does), and to get to the second floor, he must climb another steep flight of stairs (which he does again). Yes, these climbs lend to the ongoing effort and Scottie’s willingness to surrender to Madeleine, but when he gets to the second story room, she’s not there. And that’s because she’s not up … she’s down. Climbing won’t get Scottie closer to Madeleine – only descending (into madness) will. The next day, Madeleine leads Scottie from her apartment straight to the museum (which is still a downward drive, representing Scottie’s ever-growing psychological descent), and from the museum, she leads him to Fort Point, which sits at the base of the Golden Gate Bridge at San Francisco Bay. Down, down, down Scottie continues to go, both physically and mentally. Fort Point is at sea-level, and there is no going lower than that in San Francisco … unless you go into the Bay itself, which Madeleine does, with a jump that appears to be a suicide attempt. Of course, Scottie follows to rescue her. Short of donning scuba gear, Scottie has reached the end his descent – he can go no lower physically, nor can he go any lower mentally. He appears to be Madeleine’s, lock, stock, and sea-level barrel, but Hitchcock makes sure to prove that to us the next day. After saving Madeleine, Scottie brings her to his townhouse (the exterior of which is always shot by Hitchcock at a downward angle), but she soon slips out while he is on the phone. The next day, Scottie resumes his surveillance, and Madeleine leads him on the longest journey yet through the heart of the city, with more turns and steeper hills, only to end up back at his place. This is Hitchcock at his best in this film; this is Hitchcock telling us that Scottie, in order to find himself, must travel long and winding and down. And then Hitch gets even better. When Scottie meets Madeleine at his place, neither have specific plans, so they decide to “wander” together, but before they go, when she is in her car and he is on the outside talking to her, she mentions to Scottie that he left his home door open. This seems so random and meaningless on the surface, but that door represents the last chance Scottie has of reclaiming himself. If he runs to the door and runs inside the house and closes the door behind him, never to see Madeleine again, he can begin his psychological ascent back to normal. Instead, he rushes to close the door; and as the viewer you know, right there, that he has pushed all of his chips into the center of the high-stakes Madeleine table, closing the door to his past self and going all-in with her, no matter how far down all-in might be. Their next destination is another long and winding drive, this time to see the Big Basin Redwoods. And while these mighty, centuries-old trees might suggest something to do with height, I’m more intrigued by the fact that she drove the car; Scottie is no longer in control of his own destiny at this point. By giving into his obsession to her, he is merely along for the ride … her ride. It’s also on this trip when they kiss for the first time. Deal sealed. The rest of the film is cinematic history. If you have seen it, you know. If you haven’t, I hope I haven’t spoiled anything for you. In three short days, Scottie not only fell in love with Madeleine, he became obsessed with her to the point of sacrificing his own sanity to be with her. And therein lies the key to the importance of San Francisco to Vertigo. Where other cities in other films might represent cookie-cutter locations or easily-recognizable landmarks in otherwise two-dimensional stories, San Francisco offers something no other city could for this story or this film: a sprawling and beautifully architectured representation of one man’s soul. Michael Nazarewycz is a film buff and writer who spent his childhood watching old black-and-whites and cheesy horrors on UHF. He's been hooked ever since, and readily admits that he'll watch anything anyone would consider a motion picture, from a nickelodeon silent to a digital epic. Michael is an Editorial Contributor for US-based ManILoveFilms, a Writer for UK-based Filmoria, and he has just launched a new blog, ScribeHard on Film, where he will share more personal thoughts on movies, as well as perform in-depth analysis of the classics. 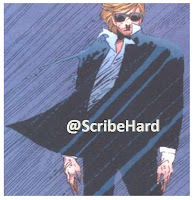 Michael invites you to follow him on Twitter @ScribeHard, where he Tweets mostly about ... what else? ... movies. I pity the movie goer who watches Vertigo and simply sees a great murder mystery. Michael, you must have a degree in psychology! I am learning so much about this film, that I don't know if I will ever see a movie the same way again. On a lighter level, San Fran is certainly the best city to film a chase scene in a movie. Think of how Bullitt, The Rock or What's Up Doc? would have done if filmed in a flat city. Could Rocky have made his run there, rather than in Philly? I must visit someday. Thanks for a great post. I wonder how much of that was consciously scripted by Hitchcock, or did his genius simply take over? 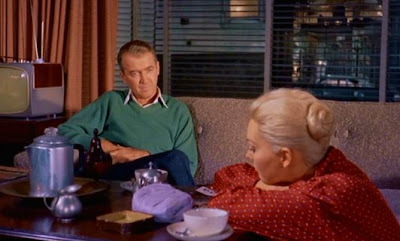 Michael, I was quite fascinated and impressed with your post about the role that San Francisco itself plays in VERTIGO! I’m impressed with all the symbolism you discussed in this post, and how it pertains to Scottie and Madeleine both emotionally and geographically. You made a particularly good point that Scottie is doing the following while his ostensible quarry Madeleine is in fact doing the leading; as The Marvelettes sang, the hunter is captured by the game! I’m impressed with all the symbolism you discussed in this post, including your observation here: “The further down the hills of San Francisco Scottie follows, the further down the path of obsession and madness Madeleine leads,” both literally and figuratively. Great post, Michael! Michael, an impressively thorough examination of the way the setting of "Vertigo" is so carefully matched to its themes and how the progression of settings cues us to the progression of Scottie's state of mind, a spiraling descent into a labyrinth of obsession and self-destruction. In addition to this, I like "Vertigo" because it shows us San Francisco, a city I know well, as it once was and never will be again, by using real parts of it in a stylized and idealized way. Compare it to, say, "Bullitt," and you'll see why "Vertigo" is the best--the most intriguing and atmospheric--San Francisco movie ever. 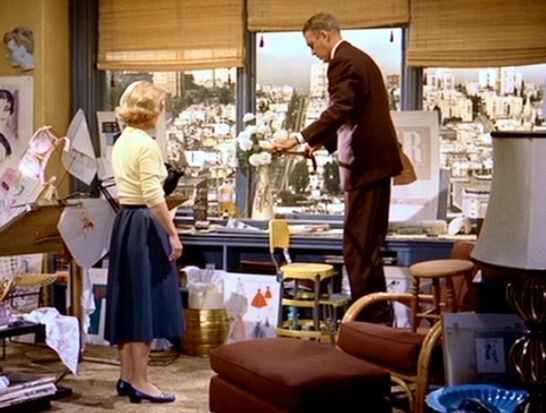 I always thought Vertigo was Hitchcock's valentine to San Francisco, and I consider it to be the quintessential San Francisco movie because the city itself is a character within itself, and Hitchcock knows this so well and works with it, preceding Woody Allen by twenty years. Michael, this is a great article. I would have never have thought that such locations chosen would further emphasize Scottie's psychological struggles and how symbolic they are to the development of his character. I will look you up at the Classic Film Union definitely. 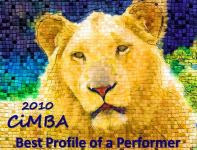 Well done, cannot wait to share my piece! I lived in San Francisco for many years (I'm still only 30 minutes away) and for me "Vertigo" makes the ultimate use of the city's unique beauty and mystery - for me it's THE San Francisco movie. Excellent job, Michael, of mapping out the psychological along with the physical terrain that Scottie is drawn through on his "fool's journey". I liked your use of the word "labyrinthine" - this aspect of San Francisco, it's twists and turns, ups and downs, are a great part of it's mystique and what, in part, contributes to it's magnetic pull for dreamers of all kinds (sleeping ones and waking ones). The City is a kind of bewitching maze. 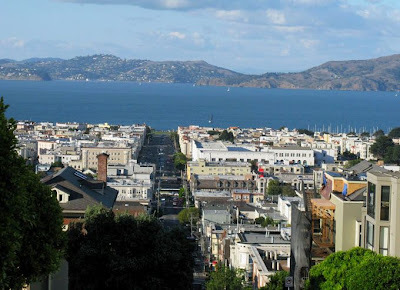 San Francisco is urbane and sophisticated but, at the same time, surrounded by the bay and the vastness of the ocean, it's also, on a visual and psychological level, still connected to nature. Hitchcock made insightful use of this connection - Madeleine's leap into the bay, the ancient redwoods, and the crashing waves of the Pacific -to establish the irresistable force of nature that inevitably overcomes civilization and man's attempts to repress it. I felt that Scottie was on a journey to solve the ultimate mystery - not just the mystery of love, but the mystery of his true nature. There is a mythic undertow to the film. 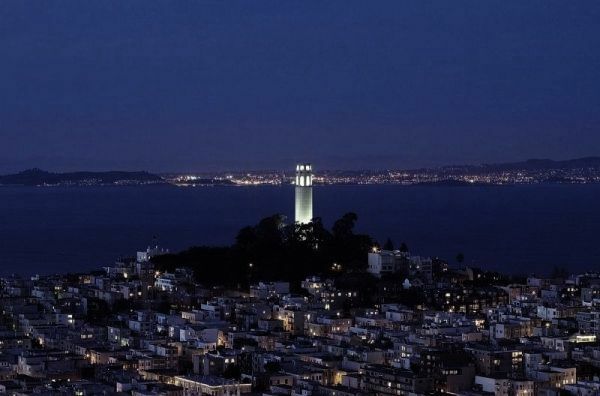 Like Dante descending into hell to find his Beatrice, Scottie searches for his feminine ideal - the fact that San Francisco resembles heaven far more than Hades was perhaps ironic but also a fundemental part of "Vertigo's" hypnotic beauty and timeless appeal. Michael – Fascinating interpretation: San Francisco as a reflection of Hitchcock’s themes and the protagonist’s psyche. I suppose my impression of the city in "Vertigo" has been, to some extent, linked to the Madeleine character: beautiful, desirable, precarious, impossible to possess. But your point is very well taken and masterfully expressed. The style and momentum with which you navigate the plot virtually sweeps the reader along with Scottie to his moment of reckoning. You make the distinction between acrophobia and vertigo. I've suffered acrophobia most of my life, but nothing remotely similar to the pervasive disequilibrium and hallucinations that haunted Scottie Ferguson night and day. 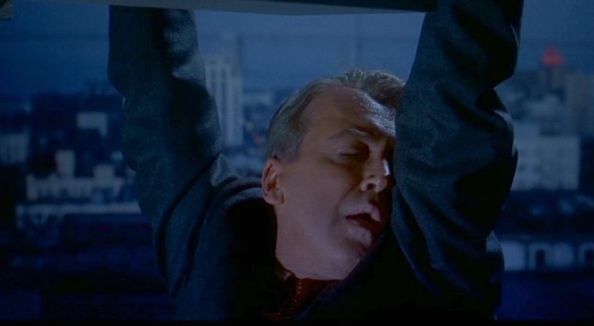 Hitchcock devised for him a malady far deeper and more deadly than a case of acrophobia (‘nothing more than a plot-point’, as you note). Thanks, Michael, for a wonderfully creative analysis. Michael, I thoroughly enjoyed your examination of how San Francisco is integrated thematically into VERTIGO. Settings often play a critical "role" in Hitchcock flms (e.g., Quebec City in I CONFESS). Like you, I can't imagine VERTIGO taking place anywhere else. That's why I find it fascinating that the most indelible image for me--the mission's bell tower at the climax--doesn't take place in San Francisco. Michael, I truly enjoyed reading your analysis of why San Francisco was the ideal location for Vertigo. I'd never really thought about what role the city's landscape played in the plot. Yet, knowing Hitch, I should have known it was important. Just a really great article. great analysis with interesting insights...there is a whole culture devoted to the sites visited by SCOTTIE...like the RAYMOND CHANDLER tour of LA/HOLLYWOOD...was SF the city in the original story??? Michael, Awesome article!! I never realized that the setting was such an important part of the story. I just thought it was a backdrop to a great film. With that said.. I can't imagine the film, VERTIGO being filmed anywhere else. Great article - the city is such an important part of the story. I have always longed to go there and see all of the places Scottie and Madeleine visited. Think I'm nuts? There is a hotel in San Francisco called "The Hotel Vertigo" and they offer "Vertigo tours." It's on my bucket list! For those (doc and FlickChick) who've mentioned the "Vertigo tour," I'll be posting a nicely done video of one fan's tour on my sidebar soon. The novel was set in Paris. 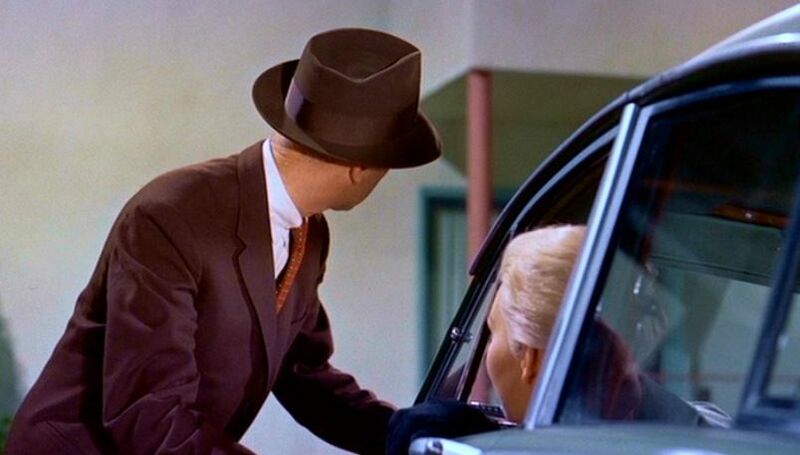 Michael, I was quite fascinated by your extraordinary depiction of the physical and psychological importance of the city San Francisco in “Vertigo”. In my research on Bernard Herrmann, I read the composer initially found two faults with the film: the casting of James Stewart as John Ferguson and the use of San Francisco as the setting. He was incredulous that Stewart would feel the passion necessary for the role, and he thought the film should have been set in New Orleans because of the city’s steamy reputation. We know, from watching the film, how Stewart’s ordinary man persona acted as the perfect vehicle for his character’s downward spiral of obsession. We also know, as you have so beautifully described, how San Francisco acts equally as a character in the film and as a co-conspirator in Madeleine/Judy’s deception. I have been to New Orleans, and while this “Crescent City” can be beautiful with an old world charm, it is a city of the mind and the writer’s page. I cannot imagine the film set in any other city, a city of treacherous physical and psychological beauty. Fascinating observations on the importance of place (San Francisco) to storyline. Hitchcock not only captured the city but integrated it into the storyline almost making it another character. Great cities like San Francisco, New York, Boston, Paris or London have a unique aura about them that cannot be duplicated, though filmmakers constantly attempt to use other cities (for financial reasons) to represent, say New York, and it just comes across as false. What a marvelous study on how Hitch and San Fran were such a fine romance, Michael. Very well done. I especially like the points you made about the twisting, turning streets and how that echoes Scotty's mind (and, let's face it, our heroine's hairstyles!). I can't wait to read what The Lady Eve shares about the novel and how Paris provides its own geographic confusion. After all, the arrondisments are designed in the shape of...you guessed it...a snail's shell, which just happens to look a lot like our gal's "relaxed" hairstyle, the coiled bun. This is SUCH a great series! I'm loving it! The city is a character itself, and you did a great job of describing how the city impacts this story and its characters.